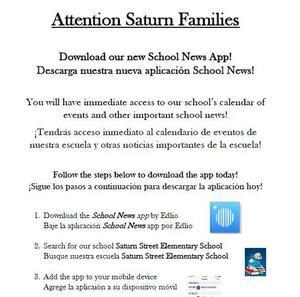 ATTENTION SATURN FAMILIES! PLEASE CHECK YOUR MAIL! We mailed home the LAUSD Title I Parent Involvement Policy and our School Parent Involvement Policy and Parent Compact on, November 30, 2018. Please notify the office if you do not receive it. Thank you! Please click on the link for important information. The eChoices magnet application for next school year has opened. The application deadline is November 9th. Click on the link above to be directed to the LAUSD eChoices web page to fill out and submit your application for Saturn Elementary and Arts & Media Magnet today! Download our School News App Today! Stay up to date with our school calendar, events, and other important information directly from your mobile device. Download the app today! Parents and Families, get CONNECTED today and create your PASSPORT account to access your student's academic information. Thank You Friends of Saturn! 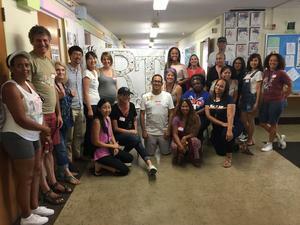 Once again our Friends of Saturn came out and volunteered their time to help us get ready for the first day of school. Thank you to Sky's Tacos and The Carrabba + Group for donating bagels, coffee, and lunch! Help Support Our Classrooms! Donate Today! Please click the link and you will be directed to our classroom wish lists. Thank you for supporting our classrooms!